Schedule parties for young kids when they behave and is the most active, neither too sleepy nor too hungry. After nap time works well for toddlers; after lunchtime is good for pre-schoolers. You will observe at as kids grow older, and they can easily handle a 2-hour party and the timing will not be an important factor anymore. You don’t have to entertain the kids for hours and hours! Toddlers and pre-schoolers have the most fun with parties kept to an hour and a half. Anywhere from two to three hours is sufficient for school-age kids, have some food and entertainment such as balloon sculpting and magic show. Time of Day: Early to Mid-Afternoon, after lunch. 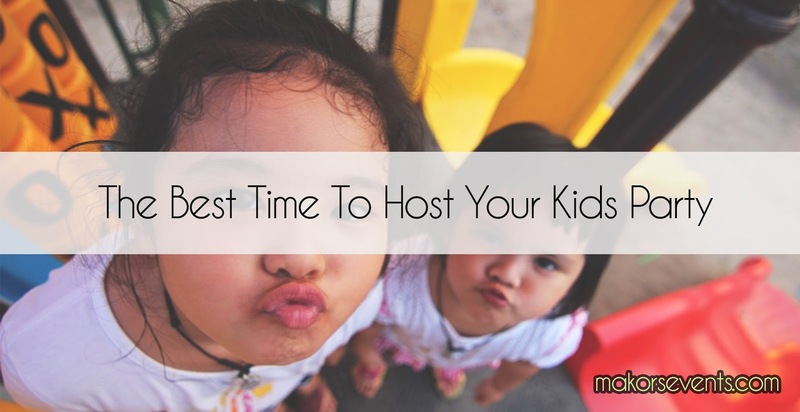 Having kids going to school full time, we are now restricted to hosting parties during weekends or holidays or an hour before their dismissal from school. Note that children younger than 9-10 years old will not be able to handle a party after school. Nap time might not be necessary for the kids but do keep in mind that they do get tired and irritable in the afternoon! Now that you have learnt the basics of choosing a party timing you are all set to plan the party, activities and food!